The name sounds good. 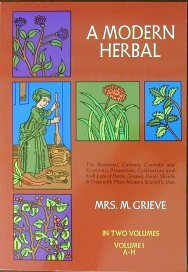 You are looking for today's information on herbs. After all, only the latest and greatest will do. And, here it is on our recommended book list. What could be better? Not much! But, this is not a book hot off the presses. This two volume encyclopedia goes back 60 years, when two women put their individual skills together to create a work that should be on every herb gardener's shelf. The writer Maud Grieve and her faithful editor Hilda Leyel created a work that has not been duplicated since. We use this book at least once a week here. Each plants many common names are listed as well as the part used and its habitat. They give us a growth description, talk about the chemical components of each herb and advise us on the medicinal action of these components and how they are used. If other species of the same genus are used that is included. 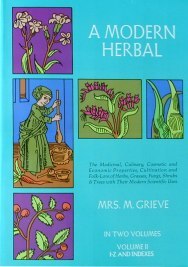 Every time we pick A Modern Herbal up we learn something new and we have been reading and studying herbs for 20 years. Two of our favorite sections are on lavender and hops. See for yourself why.